Some well defined connectivity topological indices are Randic index, atom-bond connectivity index, geometric-arithmetic index and Shigehalli & Kanabur indices, brought into light by M. Randic, Estrada et al, Vukicevic et al and V. S. Shigehalli, in their respective research articles. Topological indices preserve the symmetry of molecular structures and provide a mathematical formulation to predict their properties like boiling points, viscosity and the radius of gyrations,1 mainly their study gets a cover under the category of physical chemistry. Due to its mathematical nature, this idea has caught the attention of many chemists. It has also been reported that these indices are useful in the study of anti- inflammatory activities of certain chemical instances. 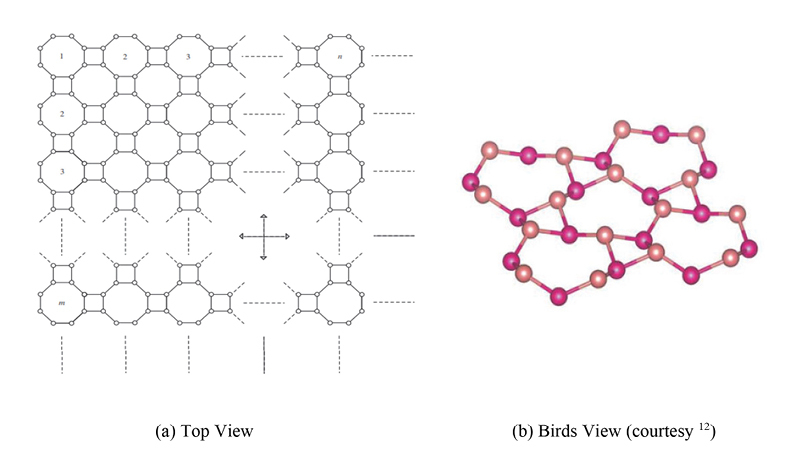 In this paper, we shall calculate these topological indices of an infinite class of octagonal tilling structures OT [m, n], which is a molecular graph of a semiconductor allotrope consisting of octagons and rectangles, for all possible values of the parameters m and n. We shall also calculate Shigehalli & Kanabur indices of infinite structure of the titania TiO2 nanotubes.